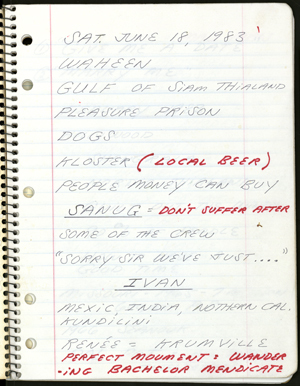 Long before viewers watched Pimp My Ride or American Chopper—in fact, long before the combustion engine—readers personalized, customized, glamorized, and just plain peacocked their books. Whether encrusted with jewels, adorned by portraits of queens, or scribbled upon with ballpoint pens, the books pictured here demonstrate post-market enhancements, or primping, as a recurring phenomenon in book culture across centuries. These volumes embody fantasies of transformation through the act of dressing up. 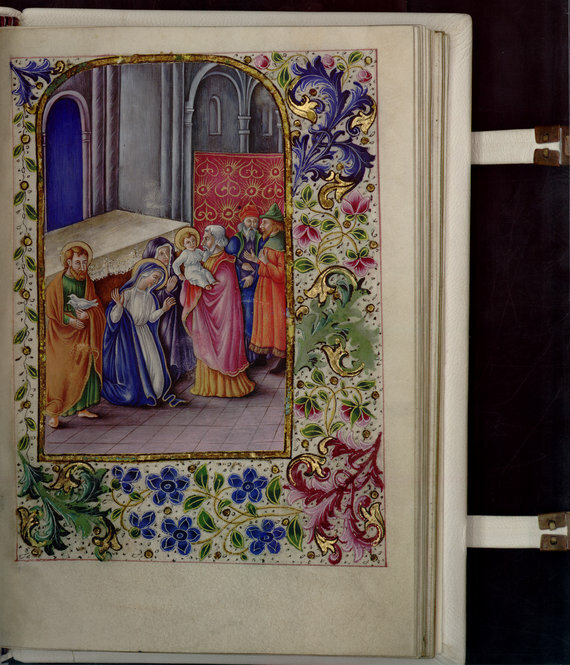 The story of the custom book starts with medieval illumination, a process that primped a book on the inside. 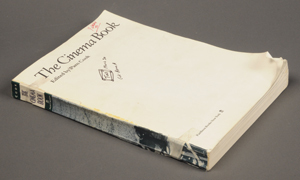 The remaining books mediate the relationship with the text through their covers. The warmth of red velvet, the chill of a silver hinge, the sparkle of precious jewel, or the smell of fine leather can create a sensory experience that complements, critiques, or even contradicts the words within the covers. 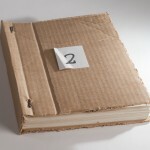 Using these diverse materials, as well as techniques from inlay to Cosway, these covers make statements, sometimes even jokes, about their books’ contents. 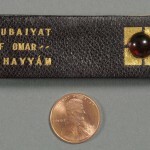 “The Rubáiyát of Omar Khayyám of Naishápúr” (Needham, MA: Rosemary Press, 1916). Miniature Book Collection. 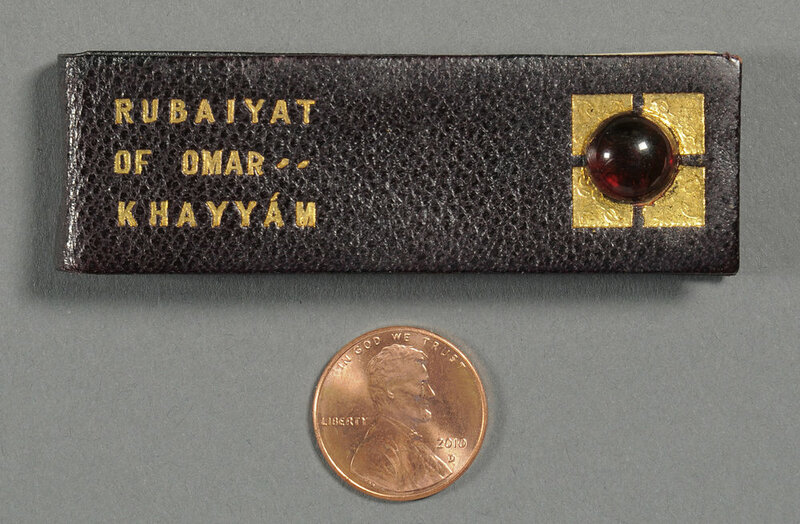 This tiny “Rubáiyát,” like others in its series, is bound in Russian leather and hand-tooled in gold. It was one of only 60 published by Rosemary Press, founded by Charles Dana Burrage (1857–1926), a Boston lawyer, naturalist, Orientalist, and the first president of the University of California Club of New England. His wee books were given as party favors at club events. Photo by Pete Smith. Thomas Moore’s “Lalla Rookh: An Oriental Romance” (London and New York: Routledge, Warne, & Routledge, 1860). 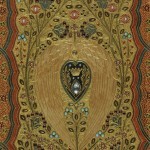 This copy of Moore’s “Lalla Rookh” was primped in the early twentieth century. 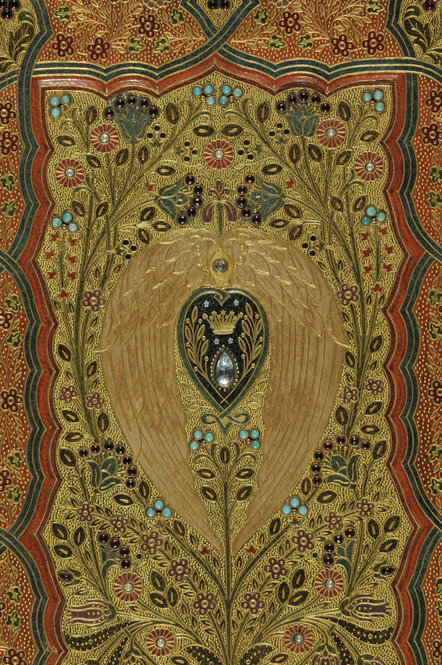 Sangorski and Sutcliffe of London bound this weighty three-pound copy in a colored leather binding inlaid with gold to form an intricate floral pattern studded with a central diamond and several rubies, pearls, and turquoises. 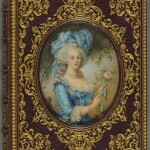 Hidden inside the front cover is a stunning Cosway-style portrait of Moore, similar to Marie Antoinette’s portrait on another book in this display. 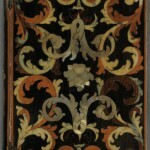 A floral pattern was chipped into the book’s gilded edges creating a bas-relief effect, not unlike the gauffered edges on the embroidered prayer book mentioned below. Photo by Pete Smith. Book of Hours (France, 15th-19th Century). 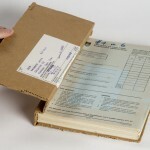 Medieval and Early Modern Manuscripts Collection. Illuminated Books of Hours, or private devotional manuals, emerged as a distinct genre in the late thirteenth century. By the fourteenth, these status symbols had become items of conspicuous consumption for the nobility. The quantity and quality of their illustrations, called miniatures, is often an indication of their value, but this particular example has a twist—these illuminations are nineteenth-century fakes. While the manuscript dates to the fifteenth century, the miniatures were either over-painted or entirely fabricated approximately 500 years later into blanks left by the medieval scribe (for just such enhancement). 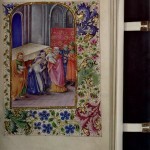 The work is probably that of a nineteenth-century artist attempting to increase the value of a medieval manuscript. Photo by Pete Smith. “Officium Beatae Mariae Virginis” (Venice: Paulus Balleonius, 1709). Dedicated to the Virgin Mary, this devotional is bound in thin wooden boards held together by metal hinges. 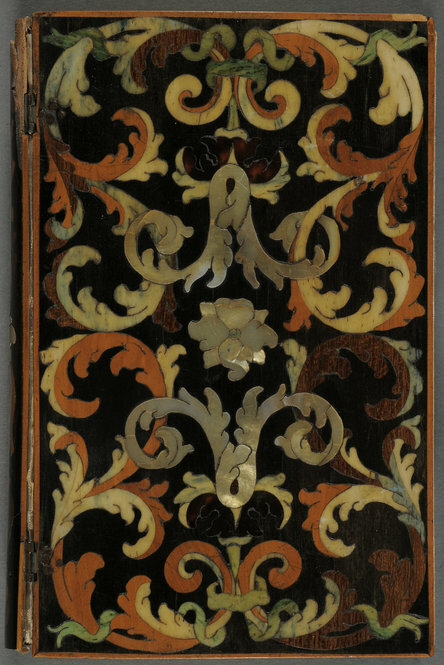 The delicate fronds and flourishes on the upper and lower covers were created by inlaying various colored woods into a black veneer. Some of these woods are stained blue and green, while others retain their natural colors. The mother-of-pearl dog-roses that adorn the covers and spine are a symbol of Mary, and thus function as both ornament and clue to the book’s content. Photo by Pete Smith. “La Mode Féminine” de 1490 à 1920, Volume 2 of 3 (Paris: Nilsson, ca. 1926). The Library of Edward Alexander Parsons. 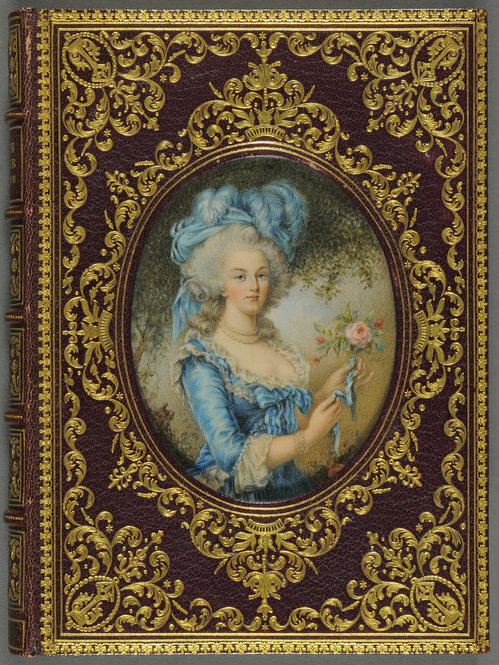 This collection of hand-colored French fashion plates features a portrait of the Queen of Fashion herself, Marie Antoinette. This portrait is an example of Cosway bindings, miniature paintings on ivory inset into gold-tooled leather covers. 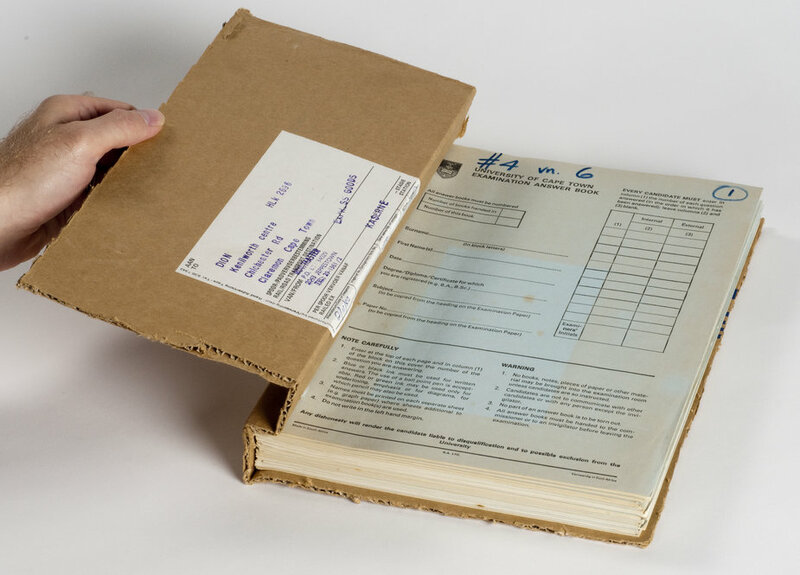 While these bindings get their name from the English miniaturist Richard Cosway (c. 1742–1821), the London bookselling firm Southeran’s is credited with their invention. Cosway bindings became popular as post-market modifications in the early twentieth century. This fashionable cover is tailor-made for its subject. 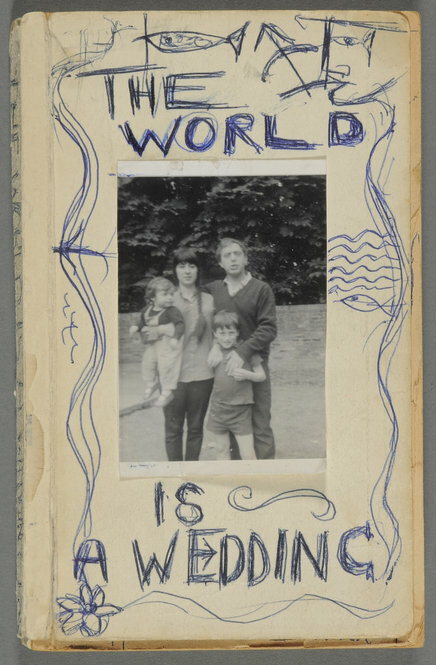 Bernard Kops’s “The World is a Wedding” (London: Mayflower-Dell, 1966). Not all post-market portraiture is elegant. 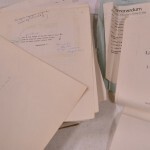 Kops modified this presentation copy of his autobiography for his friend and colleague Arnold Wesker, whose archive resides at the Ransom Center. 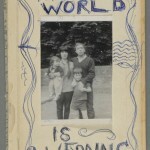 Kops removed the original cover and replaced it with the inverted cover torn from a paperback copy of Evelyn Waugh’s Brideshead Revisited, which he then decorated with pen and a family photo. 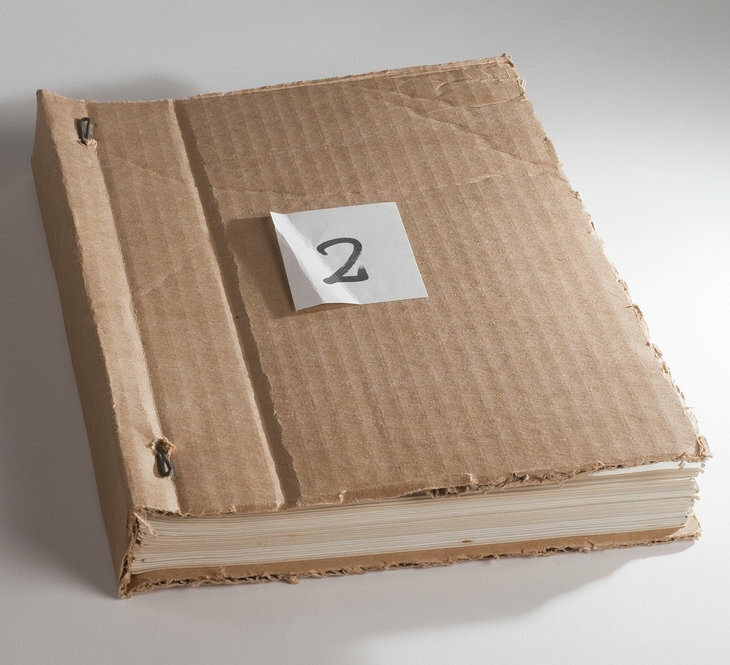 In his inscription on the title page, Kops explains, “I hated the… cover so much I made my own. Yours Bernard Kops December 65.” Photo by Pete Smith. “The New Testament of Our Lord Jesus Christ” (London: Christopher Barker, 1598). The Stark Library. 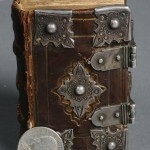 Early pocket-sized Bibles often benefitted from the protection of clasps and cornerpieces, which protected a volume’s edges from wear, enhancing longevity and portability. 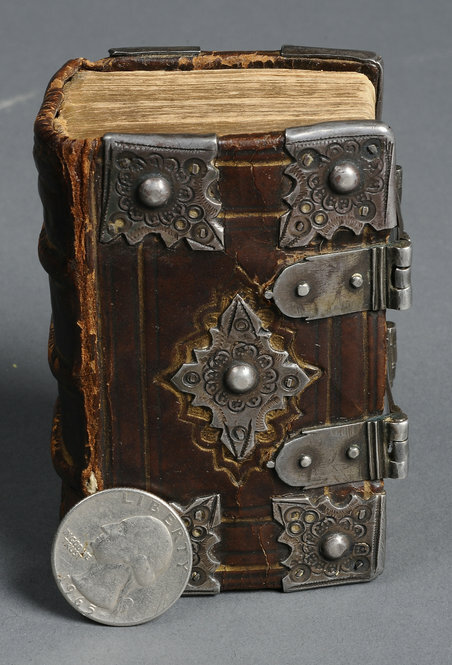 This small New Testament volume, printed by the same printer as the “Book of Common Prayer,” belonged to a wealthy individual: the edges of the pages show the remains of gilding, while the clasps and cornerpieces appear to be genuine silver. The Tudor roses visible on the cornerpieces and an inscription by a previous owner on the inside cover may link the book to Queen Elizabeth I. Photo by Pete Smith. 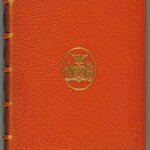 Washington Irving’s “A History of New York,” Volume 1 of 2 (New York: Inskeep & Bradford, 1809). Written under the pseudonym Dietrich Knickerbocker, this playful account of New York parodies earlier histories. 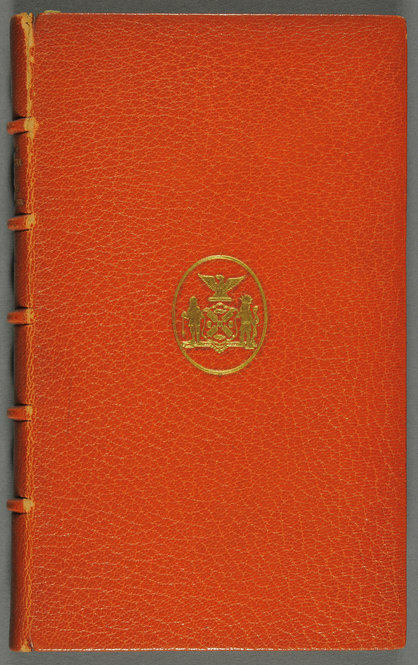 Owned by the New York cotton magnate M. C. D. Borden and bearing the seal of New York City on its cover, this first-edition copy was re-bound by prominent Parisian bookbinder Georges Canapé (1864–1940) close to 100 years after its printing. The bright orange color may hint at New York’s Dutch history, while the goatskin leather, commonly used by Canapé, fits the nickname that Irving gave to New York City: Gotham, or “goat town.” Photo by Pete Smith. 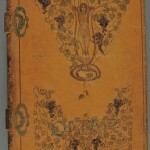 C. H. A. Bjerregaard’s “Sufi Interpretations of the Quatrains of Omar Khayyam and Fitzgerald” (New York: J. F. Taylor, 1902). Numbered edition, no. 1 of 5. The Stark Library. 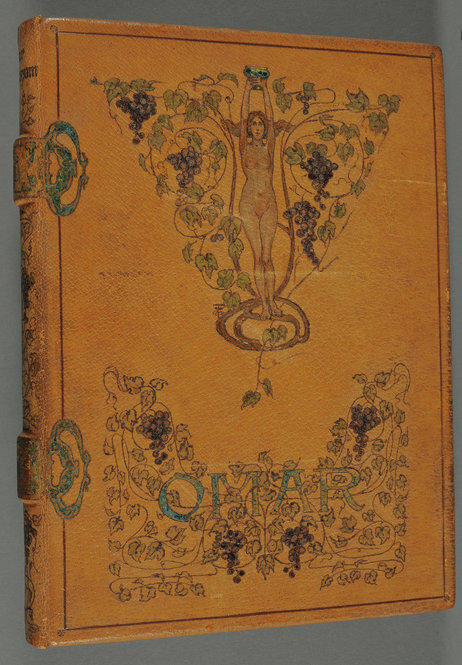 Bound in brown pigskin, this painted cover lavishly depicts Omar’s vines of wisdom, each line of the drawing seared into place by a heated tool or flame. True to Bjerregaard’s vow to explore the “mines under the vineyard,” the pages between the decorated covers—rich with watercolor paintings, additional pyrographic illustrations, and brocade backed endpapers—reveal further artistic enhancements. One of only five printed, this opulent “Jamshyd” copy presents Bjerregaard’s anti-sensualist pairing of the famous quatrains with Sufi wisdom. Photo by Pete Smith. Edward Bulwer-Lytton’s “The Last Days of Pompeii” (London: Collins, ca. 1910s). The Library of Edward Alexander Parsons. Polished wooden inlaid boards cover this otherwise unassuming edition of Lytton’s popular novel, leaving the original spine visible. The inlaid upper cover is composed of at least eight separate pieces of wood, cut and fitted together so precisely that the surface feels completely smooth to the touch. 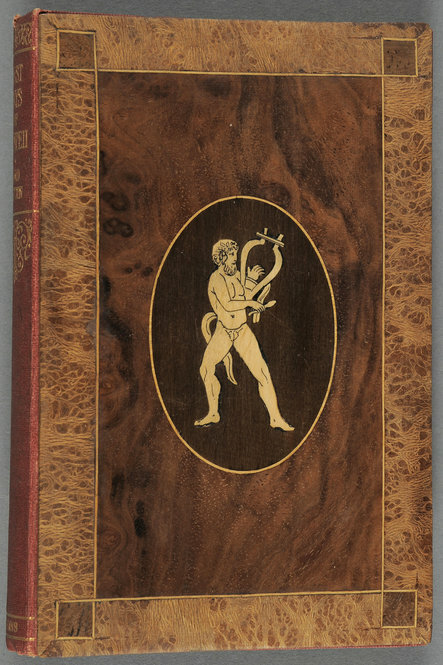 Inlaid bindings peaked in popularity in the seventeenth and eighteenth centuries, so this early twentieth-century repackaging was likely a deliberately anachronistic choice—perhaps a playful reference to the famous mosaics of Pompeii. Photo by Pete Smith. “Book of Common Prayer” (London: Christopher Barker, 1586). 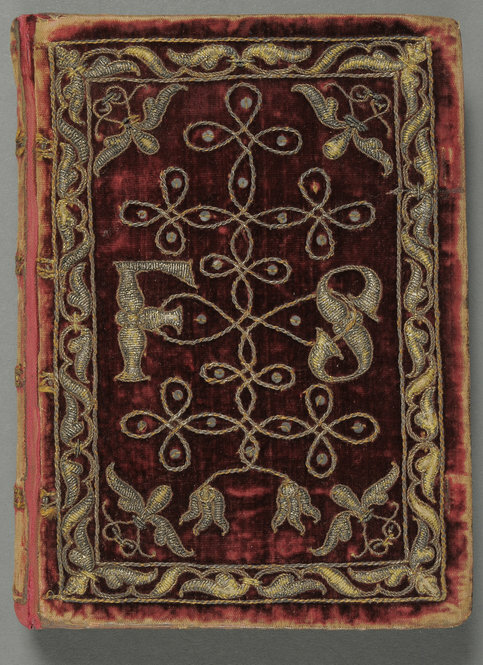 Embroidered with silver cord and thread, this rare surviving example of textile binding features red velvet covers decorated with spangles. 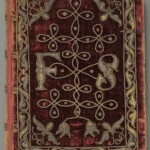 Although the exact date of this binding is unknown, it closely resembles the embroidered velvet Bible presented by the same printer, Christopher Barker, to Queen Elizabeth I as a New Year’s gift in 1584. The identity of ‘F. 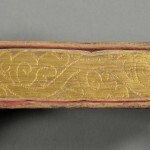 S.’ remains a mystery, but the gauffered edges—gilded, and then impressed with patterns by a heated tool—indicate that this book was owned by a member of the upper class. A final clue to the mysterious owner’s status lies in a 1638 statement by a guild of English embroiderers, who claimed that their book covers were fit for the “Nobility and Gentry of this kingdome… and not for common persons.” Photo by Pete Smith. Gauffered edget of the “Book of Common Prayer.” Photo by Pete Smith. Students in The University of Texas at Austin Professor Janine Barchas’s fall 2010 graduate seminar, English 384k: Graphic Design & Literary Text put together a display case at the Ransom Center with these examples of various bindings. This display can be seen during Reading Room hours through the end of January. Students who worked on this project include Lynn Cowles, Colleen Eils, Jennifer Harger, Brianna Hyslop, Aaron Mercier, Michael Quatro, Robin Riehl, Jessica Shafer, Connie Steel, Laura Thain, Joanna Thaler, and Jay Voss. 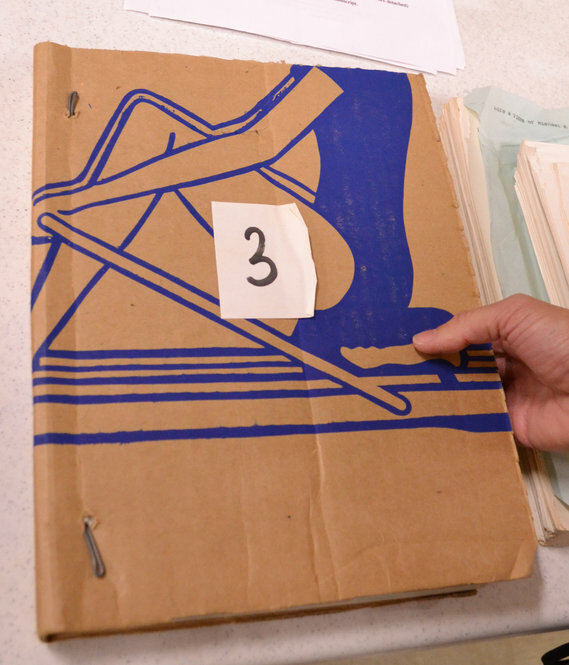 Corporal Dashiell Hammett’s "The Battle of the Aleutians: A Graphic History, 1942–1943"
A few weeks ago, the Ransom Center received as a gift an unusual volume to add to our holdings of hard-boiled detective writer Dashiell Hammett (1894–1961). 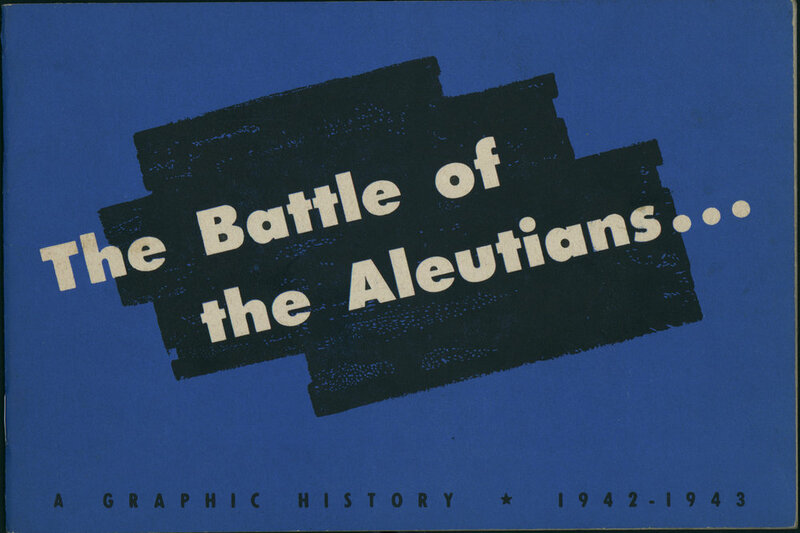 Kevin Berger, a journalist from New York, donated this booklet, which Hammett wrote for the U.S. military while he was stationed in the Aleutian Islands off the Alaska Peninsula during World War II. Berger’s father was a draftsman who also served in the Aleutians, and Berger had found the volume among his father’s drawings. We enthusiastically accepted the gift knowing that it would remedy what we call a “want”—a gap in our holdings. 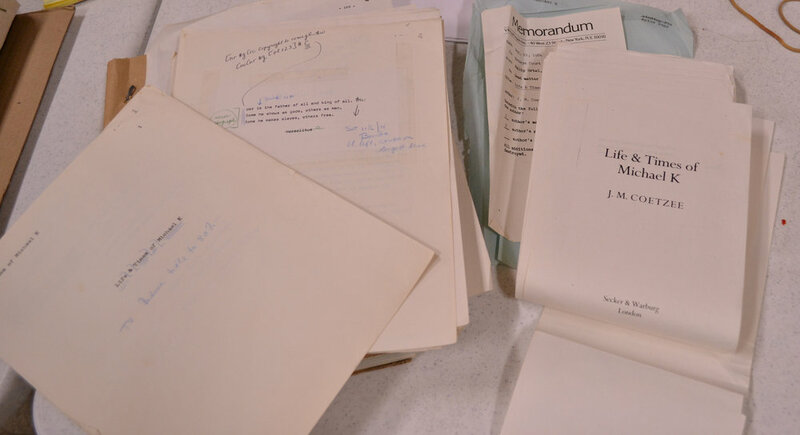 The Ransom Center is an important research site for scholars of Hammett in part because we have a small collection of Hammett’s papers and the massive archive of his longtime lover, the playwright Lillian Hellman. 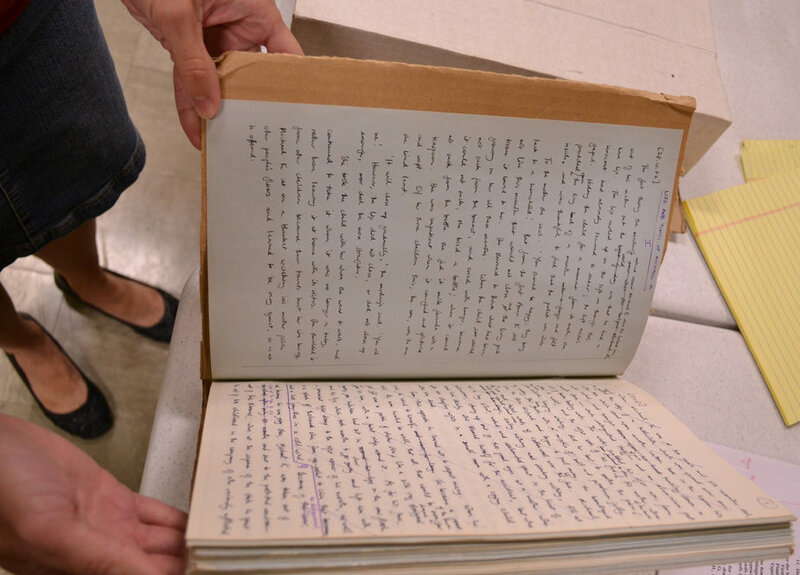 This gift is a boon to Hammett scholars not just because it fills a bibliographical gap, but because the Hammett papers, it turns out, contain a series of letters Hammett wrote to Hellman while stationed in the Aleutians. And then trouble came, a williwaw, the sudden wild wind of the Aleutians. Nobody knows how hard the wind can blow along these islands where the Bering meets the Pacific….The first morning the wind stopped landing operations with only a portion of our force ashore and, by noon, had piled many of the landing boats on the beach. The men ashore had no tents, no shelters of any kind. They dug holes in the ground and crawled into them for protection against wind and rain and cold. When the wind had quieted enough to let the others come ashore, they too dug holes and lived like that while the cold, wet and backbreaking work of unloading ships by means of small boats went on. And they did what they had to do. They built an airfield. They built an airfield in twelve days. Hammett undertook related projects such as working at the radio station, offering film screenings, and delivering evening lectures on current events. 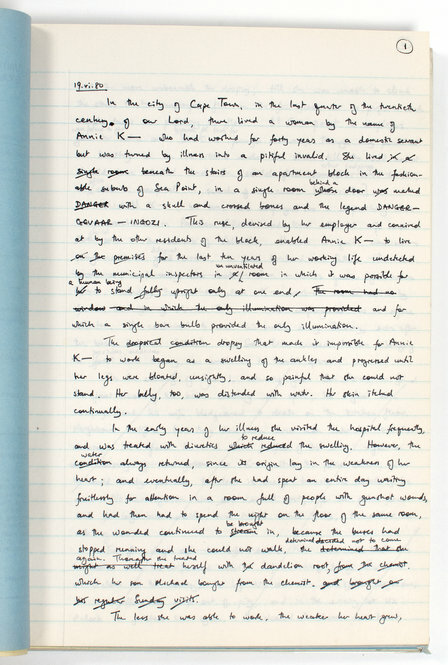 The famous writer was admired by his young staff at the newspaper and was himself an appealing curiosity for an isolated community often suffering from low morale. 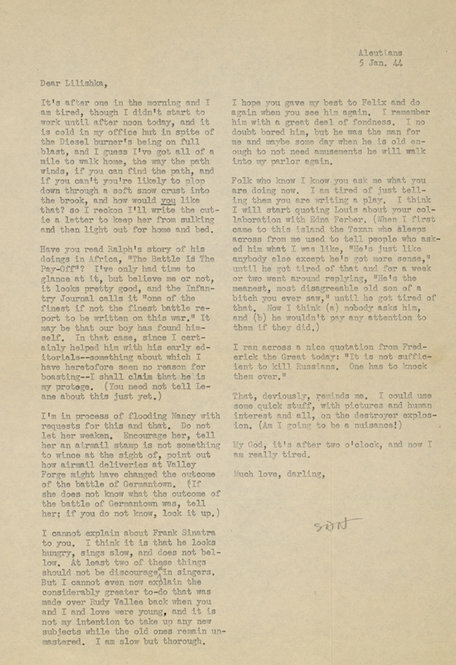 In letters to Lillian Hellman, he wrote detailed descriptions of life in the Aleutians; in the example shown here, he covers subjects such as his living conditions, his Texan bunkmate, Fred Astaire, and his thoughts on another work of war writing by Ralph Ingersoll. 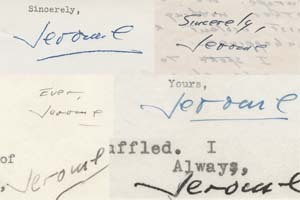 Biographer Diane Johnson (whose research materials on Hammett are part of her archive at the Ransom Center) writes that “if there were a happiest year for Hammett, it might have been this one, 1944.” Despite the austere landscape and the lack of news—not to mention fresh food—he stopped drinking and found himself to be unusually content. 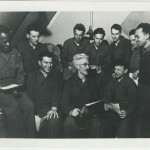 Hammett remained stationed in Adak—interrupted by a brief, unhappy period at Fort Richardson on the mainland—until the summer of 1945. Hammett’s decision to enlist had seemed strange to those close to him—he was almost 50, he had long suffered from tuberculosis, and he had a well-known distaste for mainstream American politics. But his hatred of fascism was stronger, and he performed the service he was assigned with vigor, as this little booklet shows. 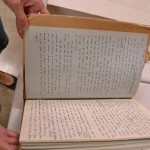 As Diane Johnson tells it, a confusion over Hammett’s given name may be the only reason he made it to the Aleutians in the first place: over the course of several months in 1943, the office of J. Edgar Hoover issued memos to the General Staff office seeking validation of a rumor that Hammett—a known Communist Party sympathizer—had somehow made his way into the U. S. Military, but they assured him there was no such serviceman. The fact was only confirmed in 1945. By that time, Hammett had been reassigned, and the magic of Adak was over. He returned to drinking and after a short time requested a discharge; he officially left the military in August 1945. 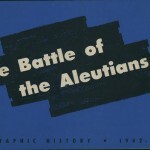 “The Battle of the Aleutians: A Graphic History, 1941–1943” (Headquarters Western Defence Command: Detachment 29th Engineers, 1944). With text by Cpl. Dashiell Hammett, captions by Cpl. 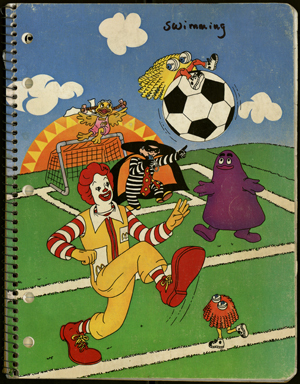 Robert Colodny, and illustrations by Sgt. Harry Fletcher. 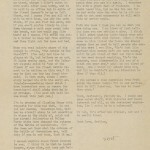 A letter from Dashiell Hammett to Lillian Hellman, January 5, 1944. 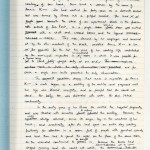 From the Dashiell Hammett papers. 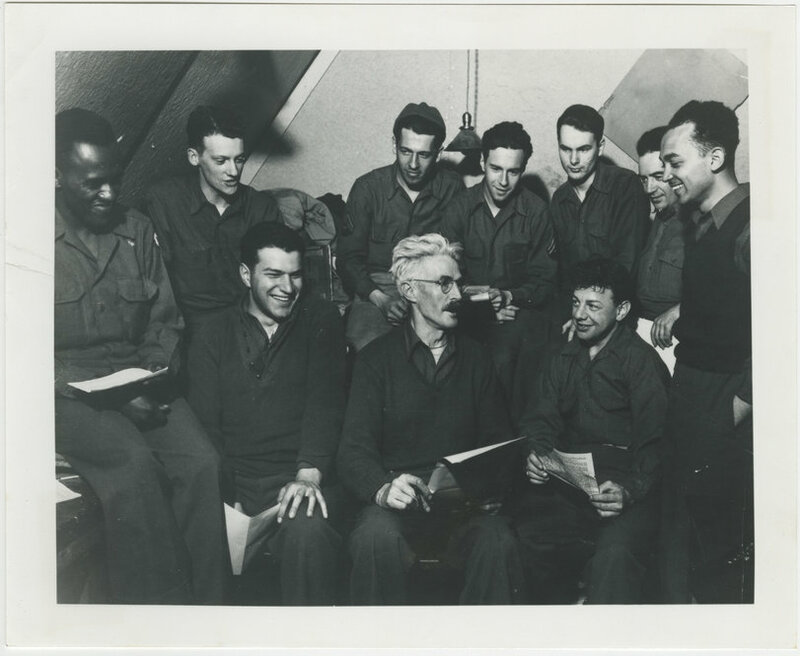 Dashiell Hammett and the staff of “The Adakian,” undated, photographer unkown. From the Diane Johnson collection.